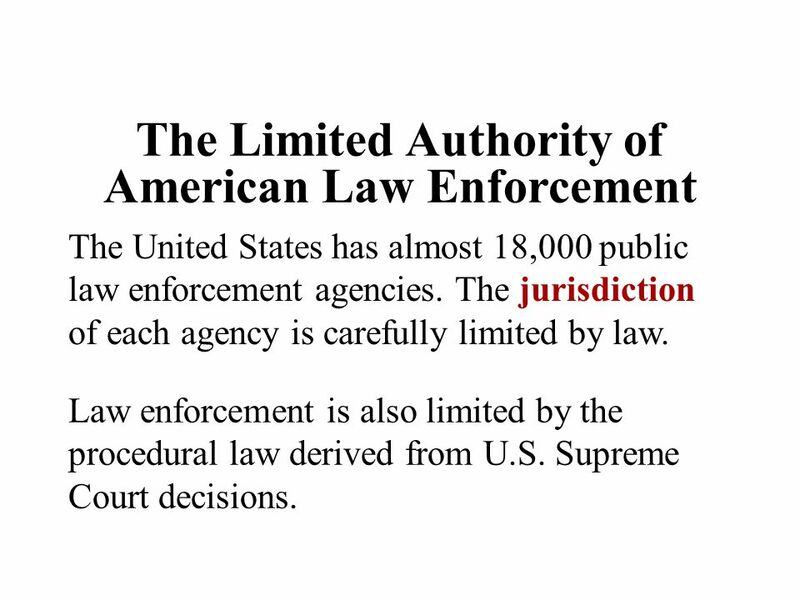 The United States has almost 18,000 public law enforcement agencies. The jurisdiction of each agency is carefully limited by law. 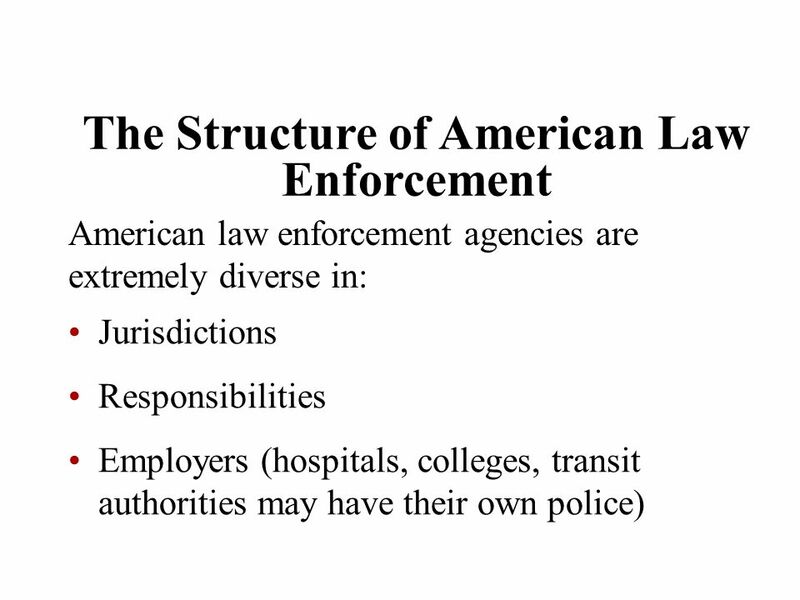 Law enforcement is also limited by the procedural law derived from U.S. Supreme Court decisions. 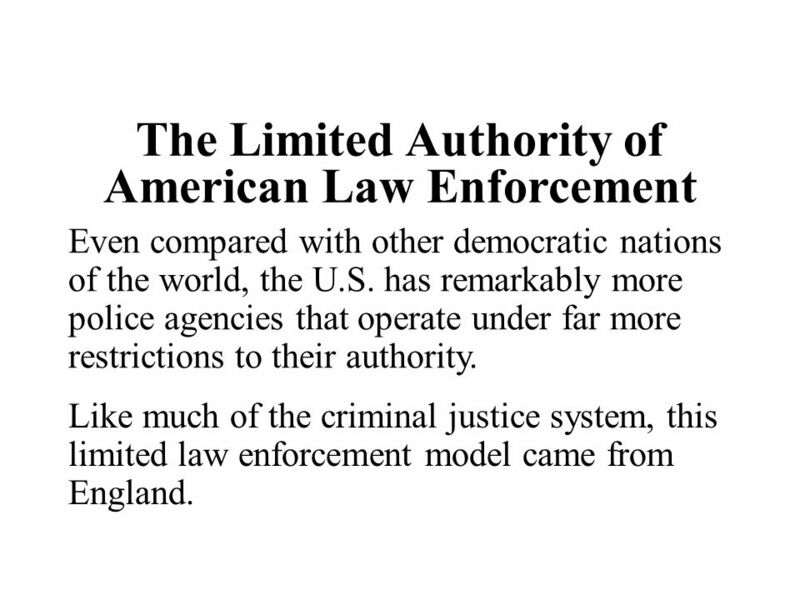 Even compared with other democratic nations of the world, the U.S. has remarkably more police agencies that operate under far more restrictions to their authority. Like much of the criminal justice system, this limited law enforcement model came from England. 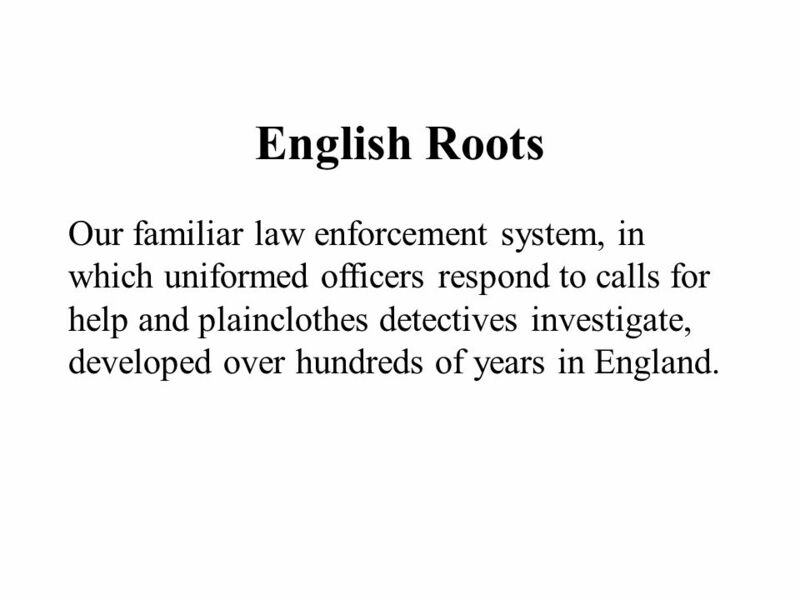 4 English Roots Our familiar law enforcement system, in which uniformed officers respond to calls for help and plainclothes detectives investigate, developed over hundreds of years in England. 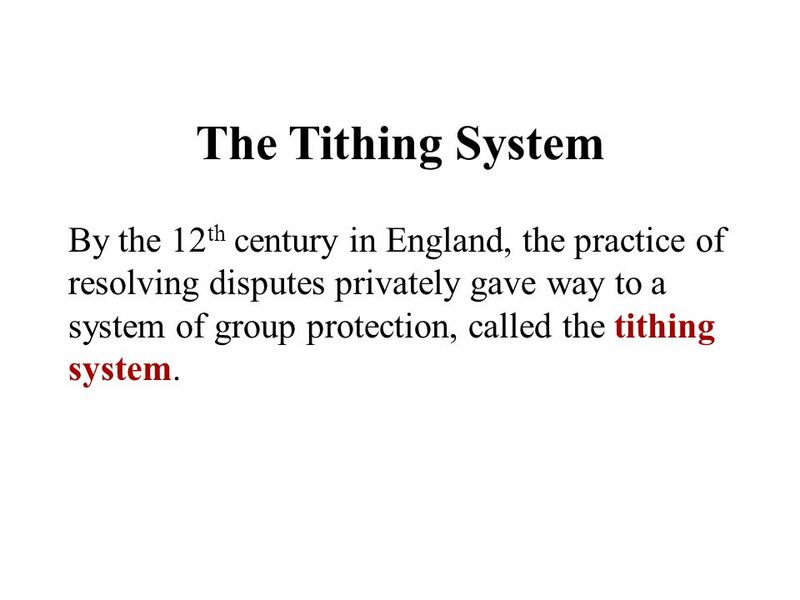 5 The Tithing System By the 12th century in England, the practice of resolving disputes privately gave way to a system of group protection, called the tithing system. 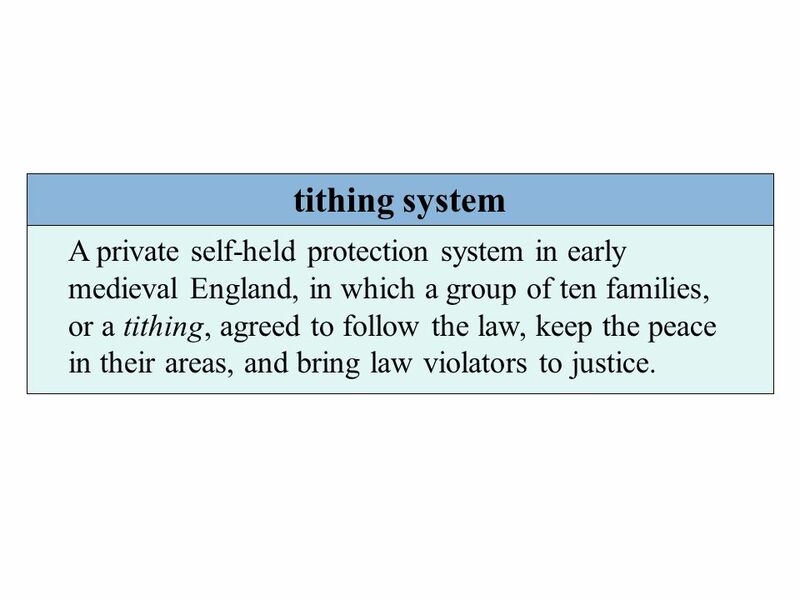 6 tithing system A private self-held protection system in early medieval England, in which a group of ten families, or a tithing, agreed to follow the law, keep the peace in their areas, and bring law violators to justice. 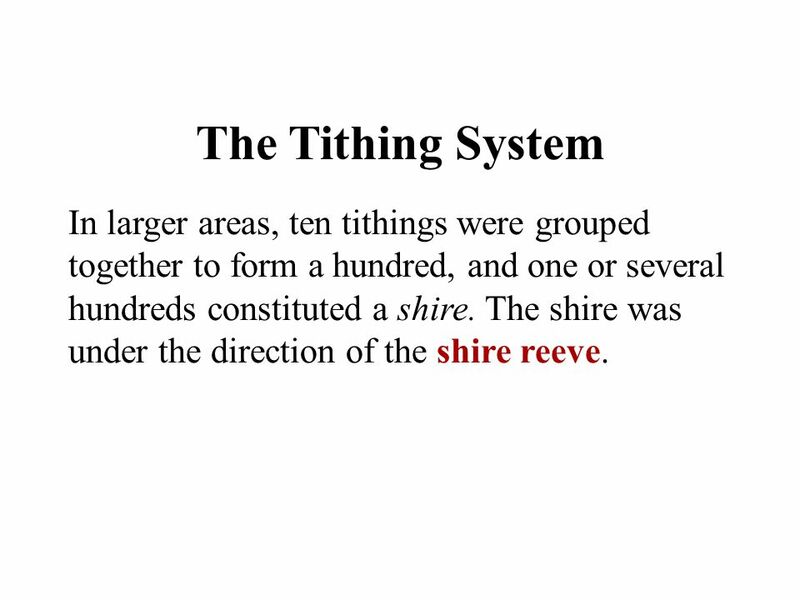 7 The Tithing System In larger areas, ten tithings were grouped together to form a hundred, and one or several hundreds constituted a shire. The shire was under the direction of the shire reeve. 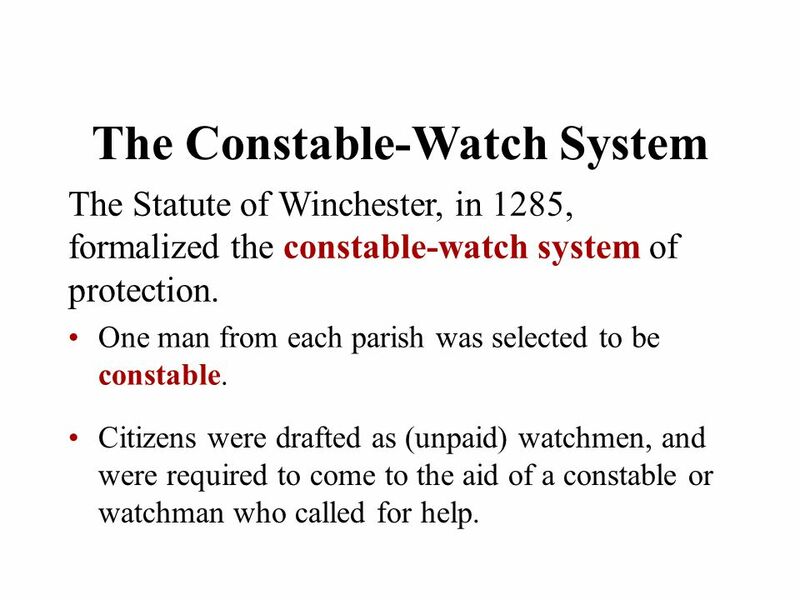 The Statute of Winchester, in 1285, formalized the constable-watch system of protection. One man from each parish was selected to be constable. Citizens were drafted as (unpaid) watchmen, and were required to come to the aid of a constable or watchman who called for help. 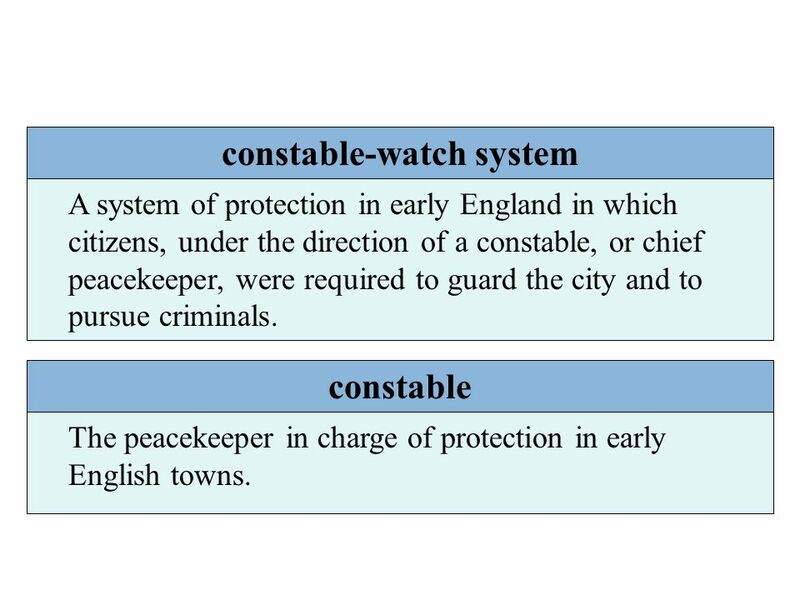 A system of protection in early England in which citizens, under the direction of a constable, or chief peacekeeper, were required to guard the city and to pursue criminals. constable The peacekeeper in charge of protection in early English towns. The Industrial Revolution brought a huge influx of people into London, and along with them, increasing poverty, public disorder, and crime. 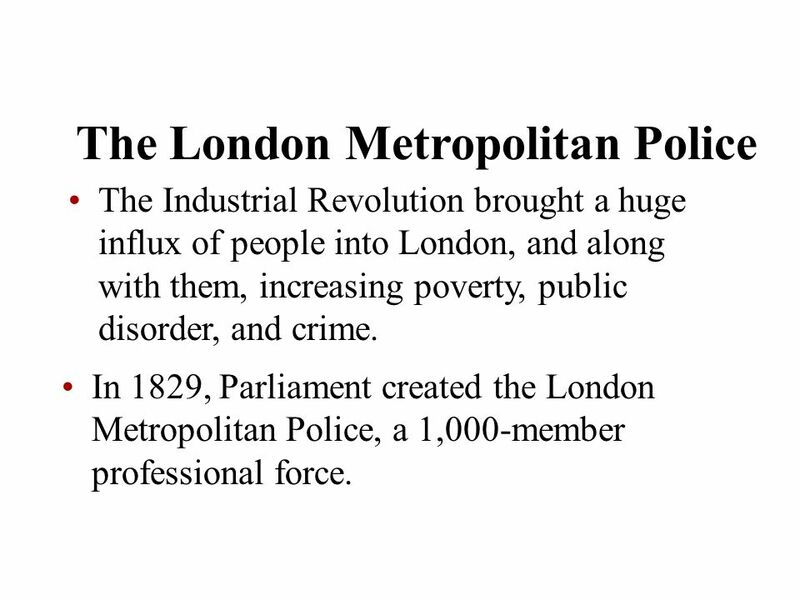 In 1829, Parliament created the London Metropolitan Police, a 1,000-member professional force. 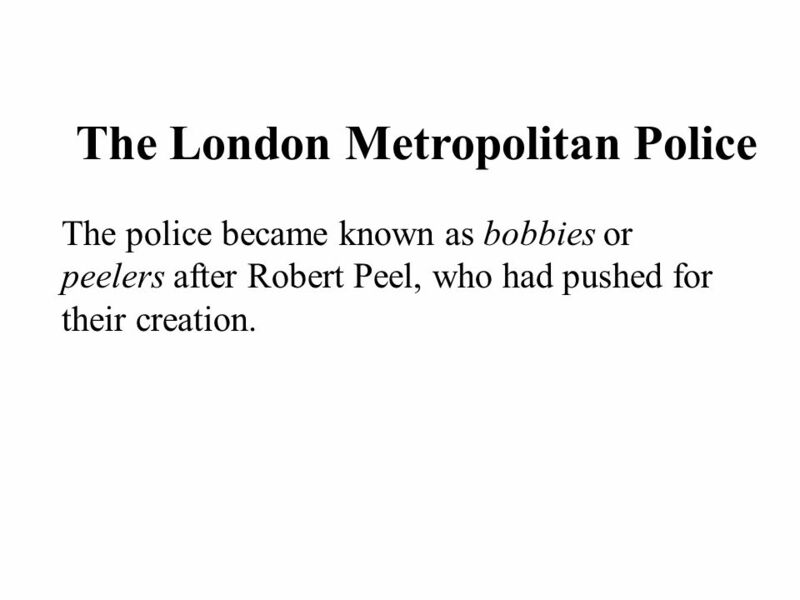 The police became known as bobbies or peelers after Robert Peel, who had pushed for their creation. 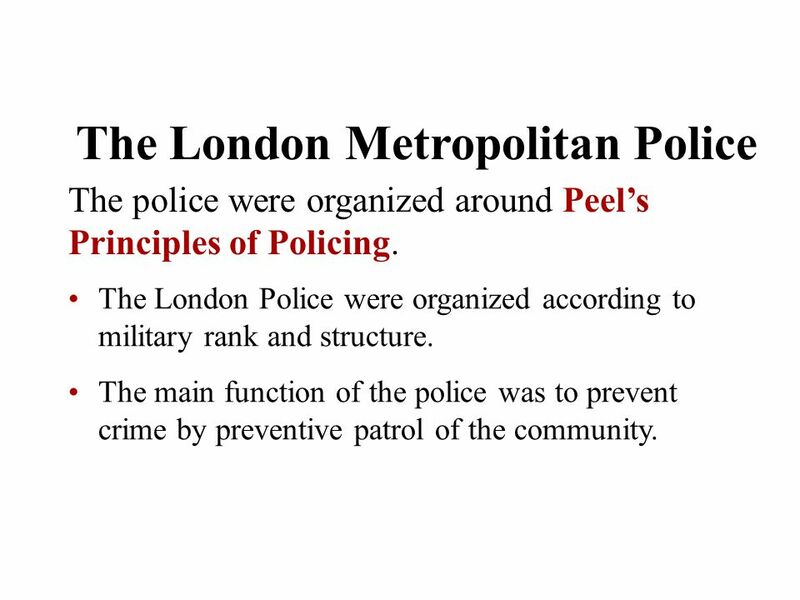 The police were organized around Peel’s Principles of Policing. The London Police were organized according to military rank and structure. The main function of the police was to prevent crime by preventive patrol of the community. 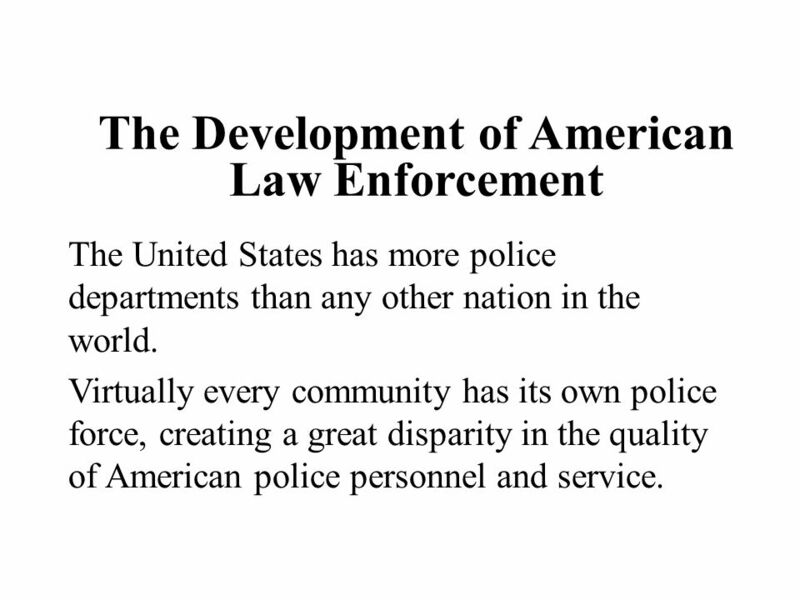 The United States has more police departments than any other nation in the world. Virtually every community has its own police force, creating a great disparity in the quality of American police personnel and service. Settlers to the new American colonies brought with them the constable-watch system, which became common (although not necessarily effective) in cities. In many rural areas, a sheriff and posse system was commonly used. 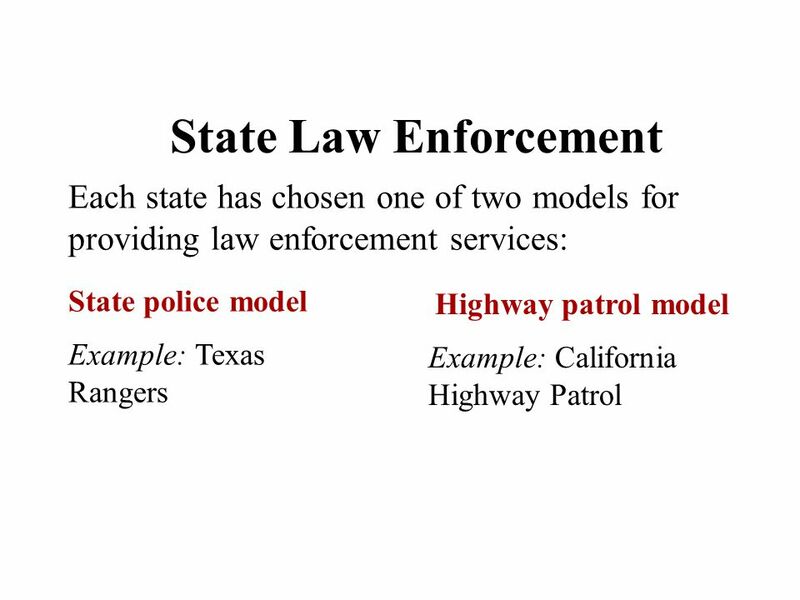 America developed with two separate law enforcement systems. In 1844, New York City created the first paid, unified police force in the U.S. Other cities followed suit, creating their own police departments, often merely an organization of the existing day and night watch. 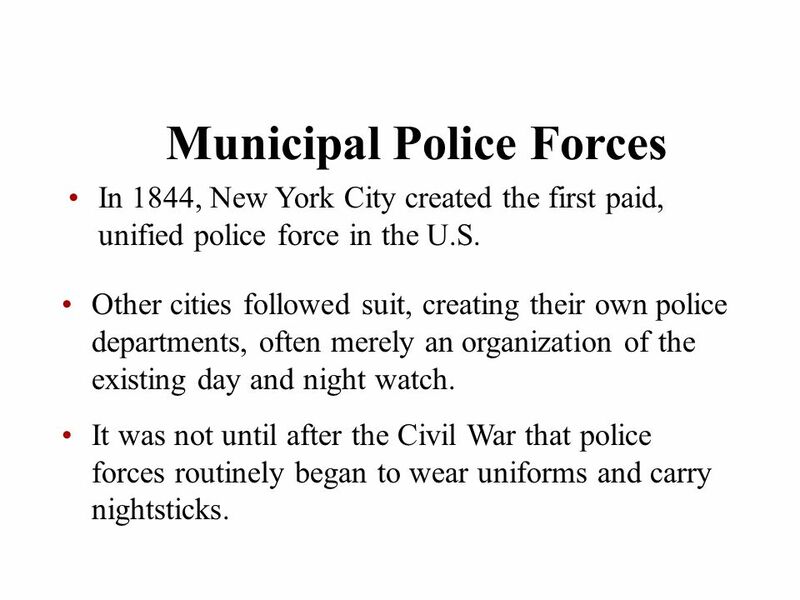 It was not until after the Civil War that police forces routinely began to wear uniforms and carry nightsticks. 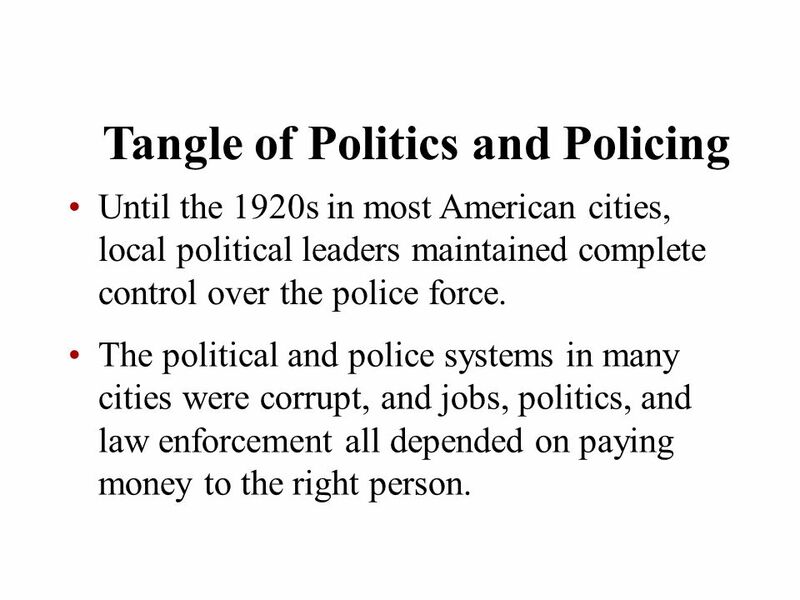 Until the 1920s in most American cities, local political leaders maintained complete control over the police force. The political and police systems in many cities were corrupt, and jobs, politics, and law enforcement all depended on paying money to the right person. In the South, the earliest form of policing was the plantation slave patrols. 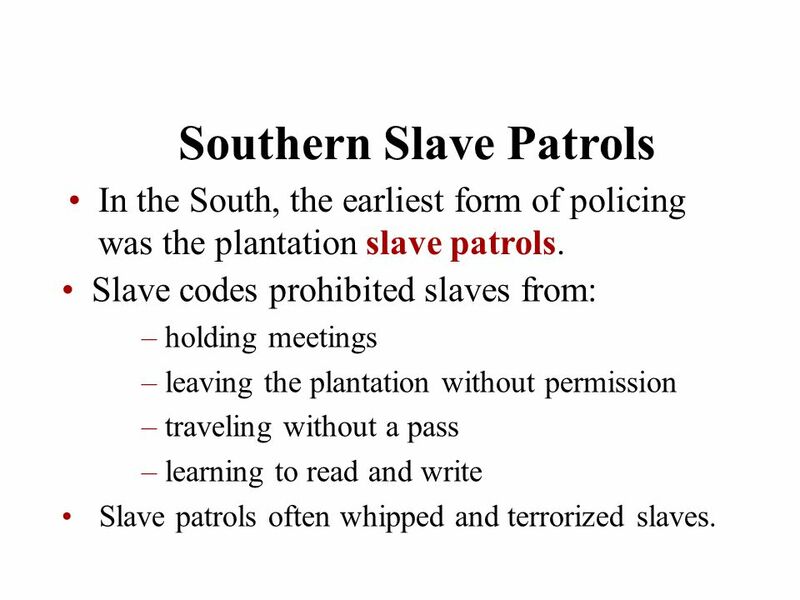 Slave codes prohibited slaves from: holding meetings leaving the plantation without permission traveling without a pass learning to read and write Slave patrols often whipped and terrorized slaves. 18 slave patrols The earliest form of policing in the South. They were a product of the slave codes. In the American frontier, justice often meant vigilantism. Self-protection remains very popular in the South and West. 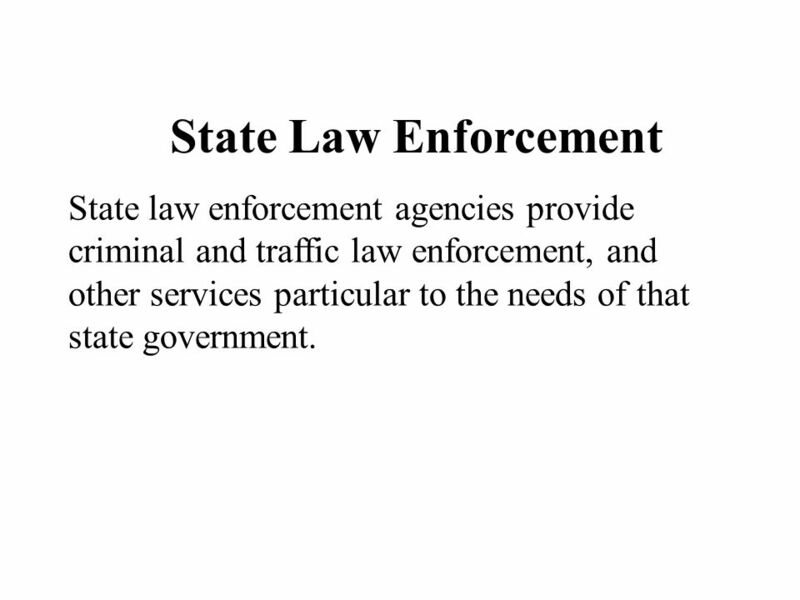 20 State Police Agencies Growing populations, as well as the inability of some local sheriffs and constables to control crime, led states to create their own law enforcement agencies. Texas officially created the Rangers in 1835. 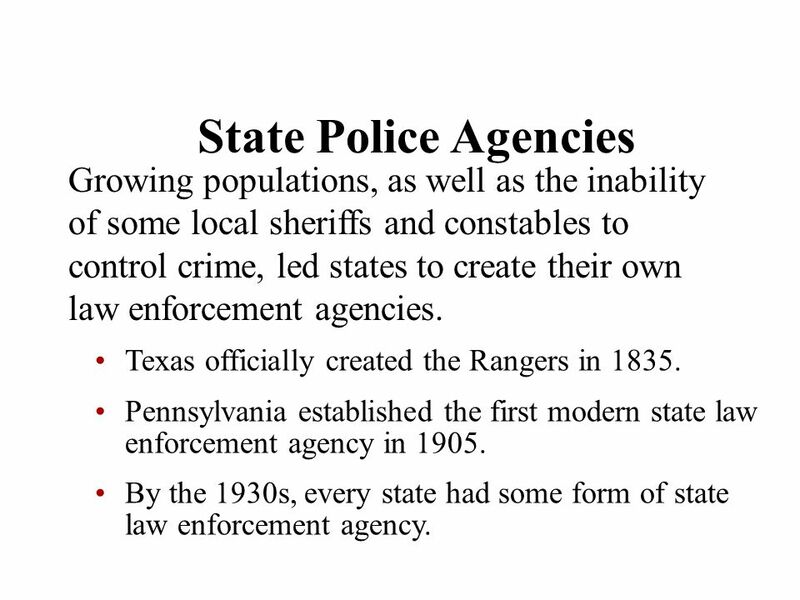 Pennsylvania established the first modern state law enforcement agency in 1905. 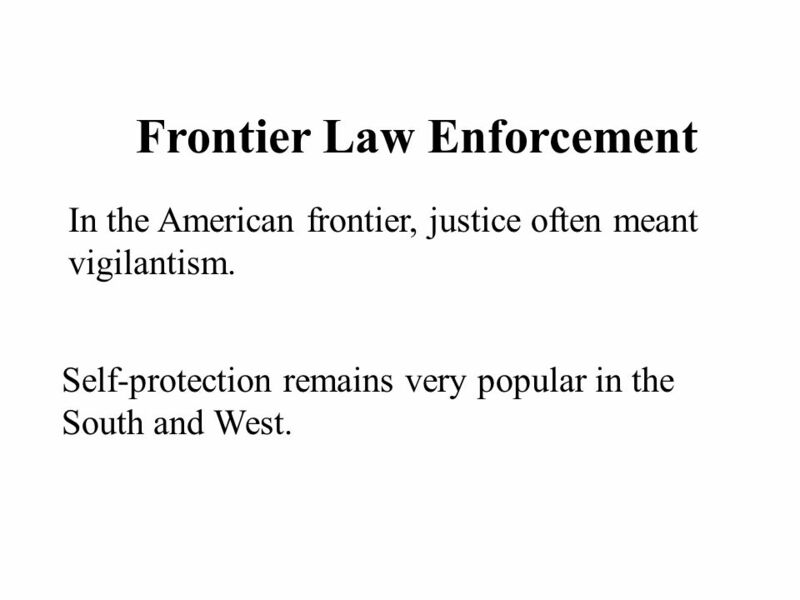 By the 1930s, every state had some form of state law enforcement agency. 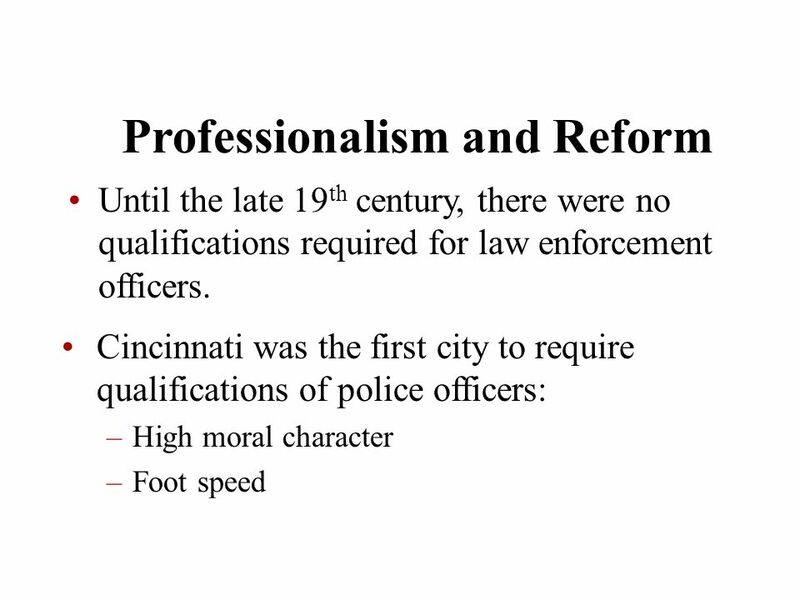 It was not until the early 20th Century that reformers began advocating training and education for police officers. 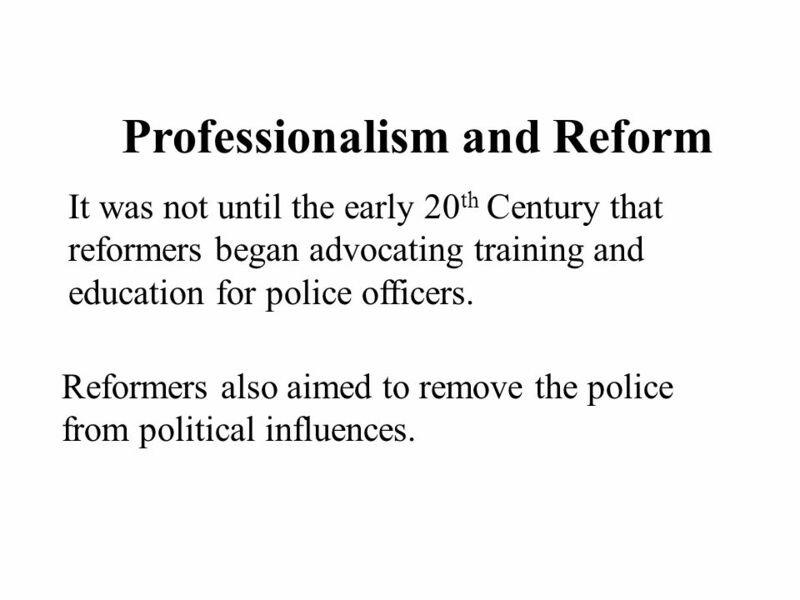 Reformers also aimed to remove the police from political influences. 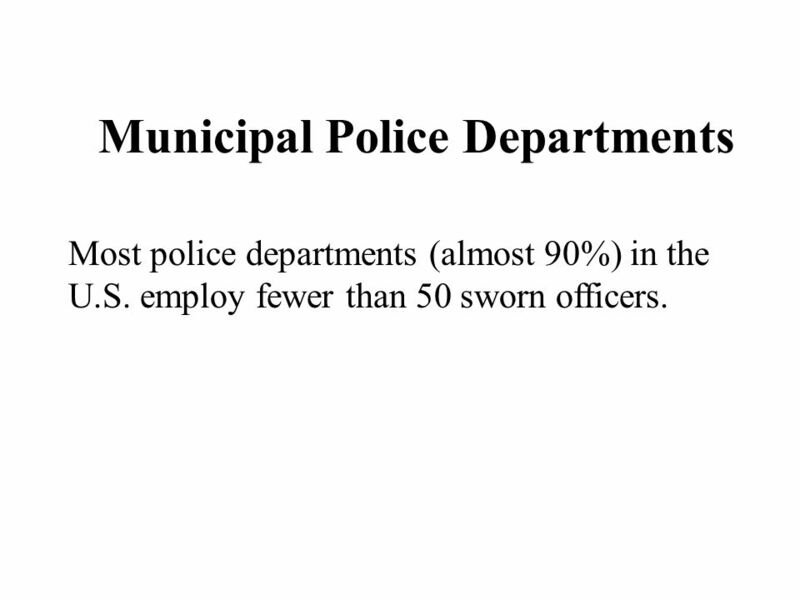 Most police departments (almost 90%) in the U.S. employ fewer than 50 sworn officers. Large departments have many specialized departments. 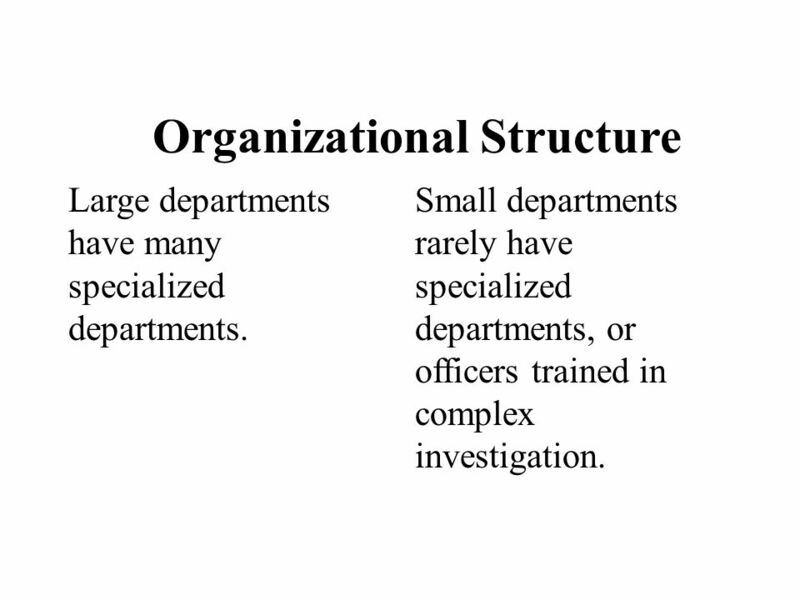 Small departments rarely have specialized departments, or officers trained in complex investigation. 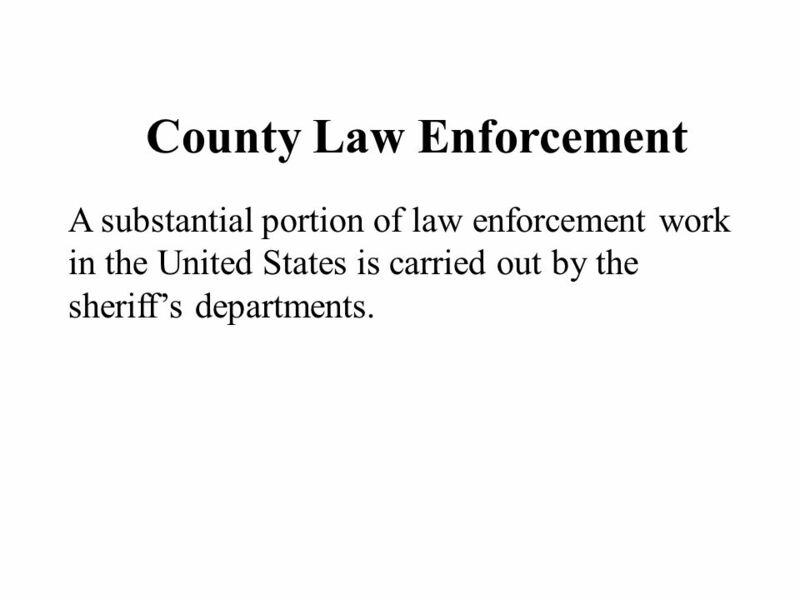 A substantial portion of law enforcement work in the United States is carried out by the sheriff’s departments. 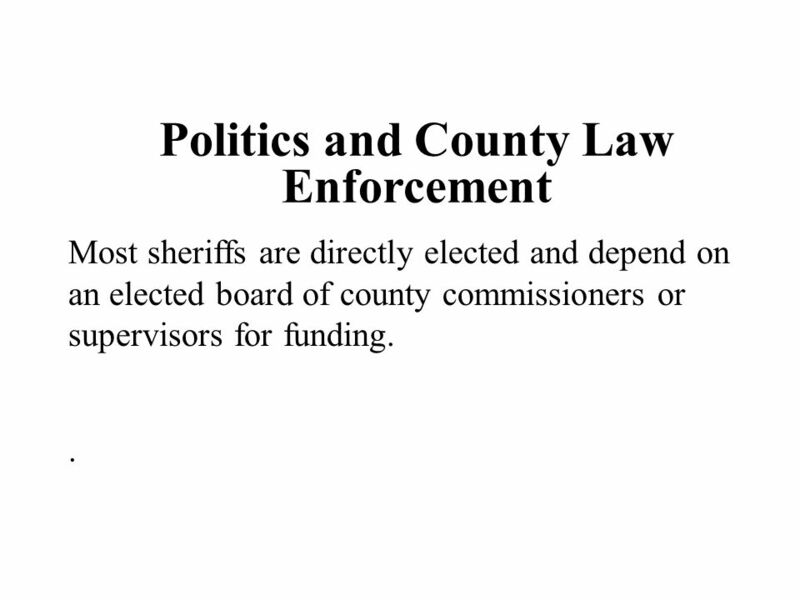 Most sheriffs are directly elected and depend on an elected board of county commissioners or supervisors for funding. .
30 State Law Enforcement State law enforcement agencies provide criminal and traffic law enforcement, and other services particular to the needs of that state government. 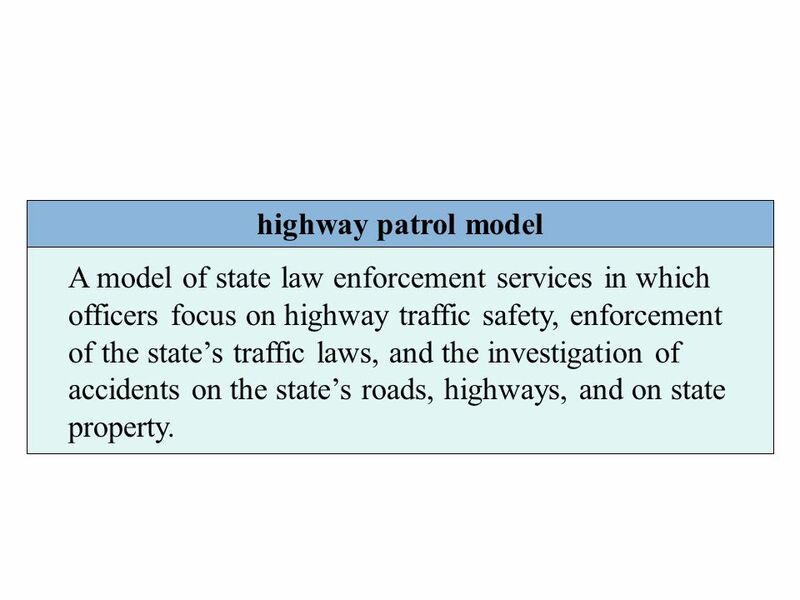 33 highway patrol model A model of state law enforcement services in which officers focus on highway traffic safety, enforcement of the state’s traffic laws, and the investigation of accidents on the state’s roads, highways, and on state property. 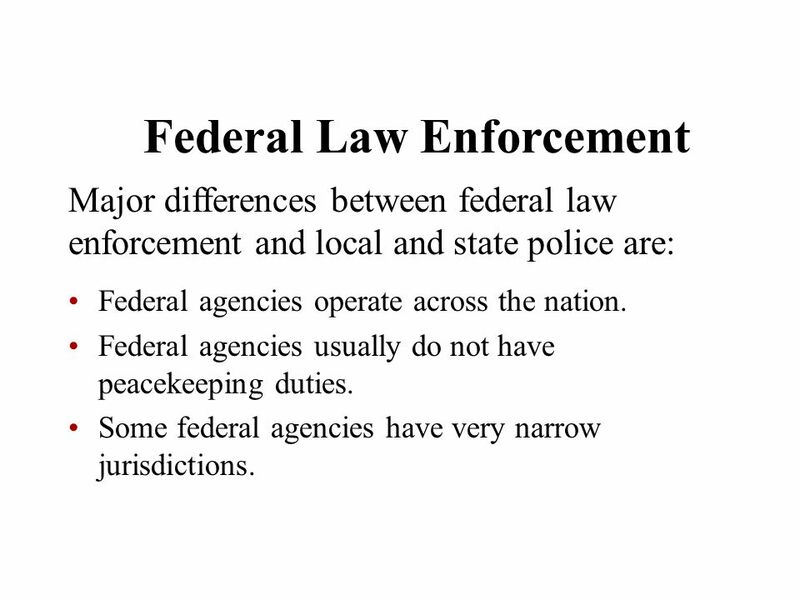 Major differences between federal law enforcement and local and state police are: Federal agencies operate across the nation. 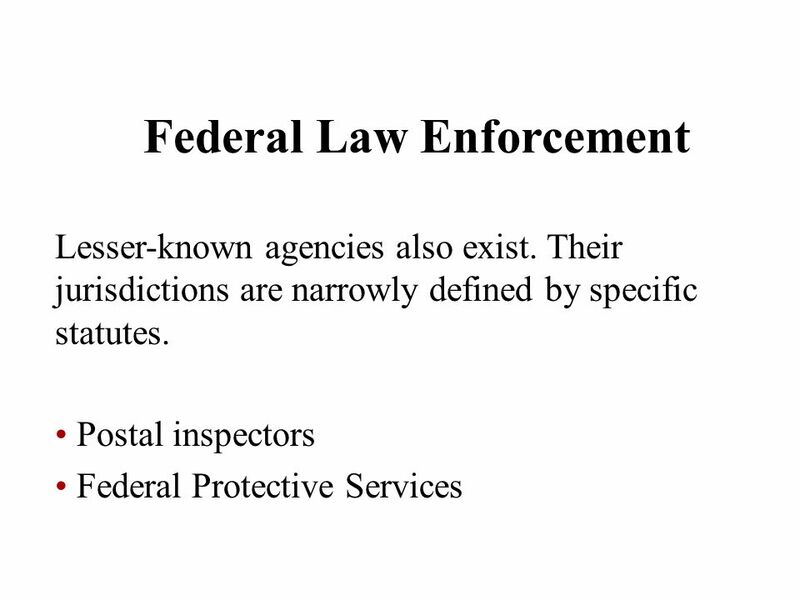 Federal agencies usually do not have peacekeeping duties. 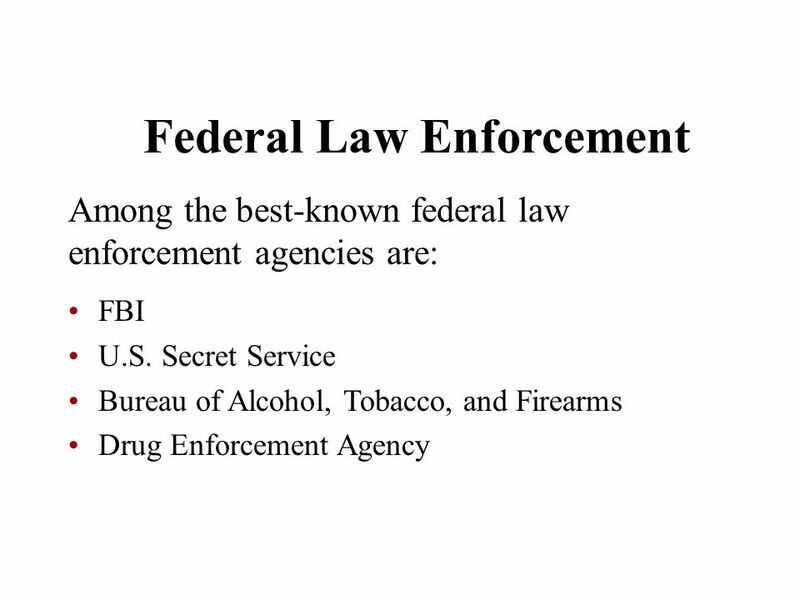 Some federal agencies have very narrow jurisdictions. 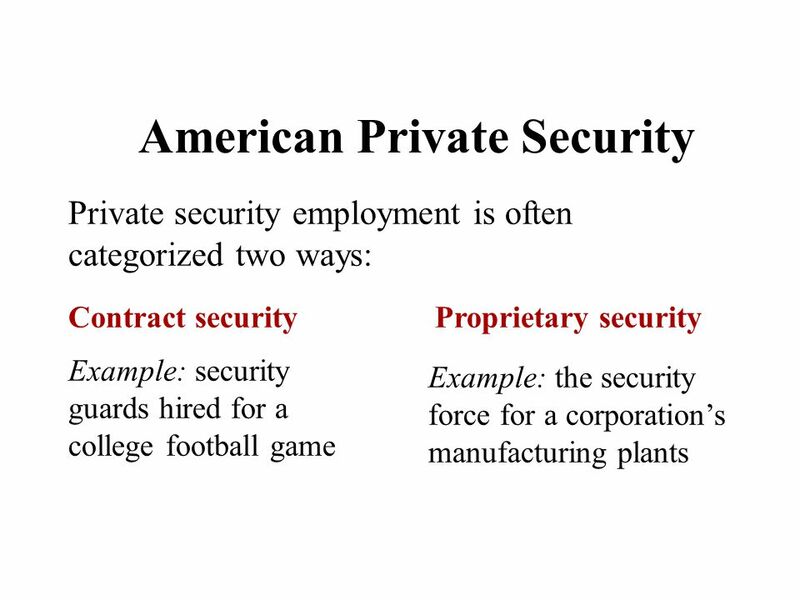 Private security in the United States is a huge enterprise. 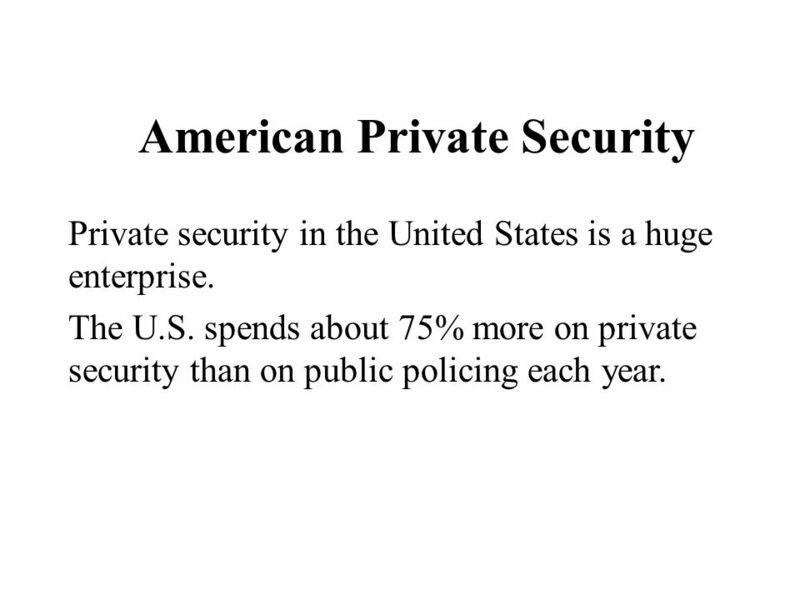 The U.S. spends about 75% more on private security than on public policing each year. 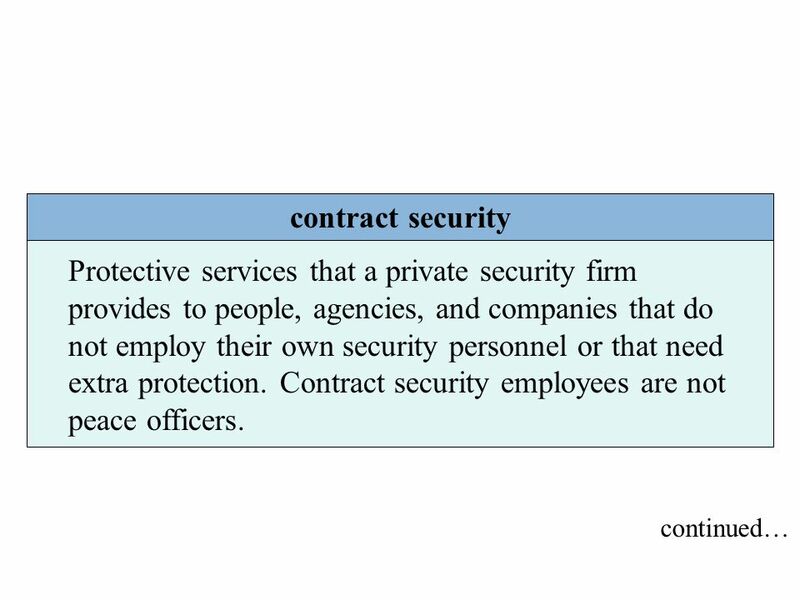 40 proprietary security In-house protective services that a security staff, which is not classified as sworn peace officers, provide for the entity that employs them. 42 Reasons for Growth Better control and attention to the problem, particularly within a business. 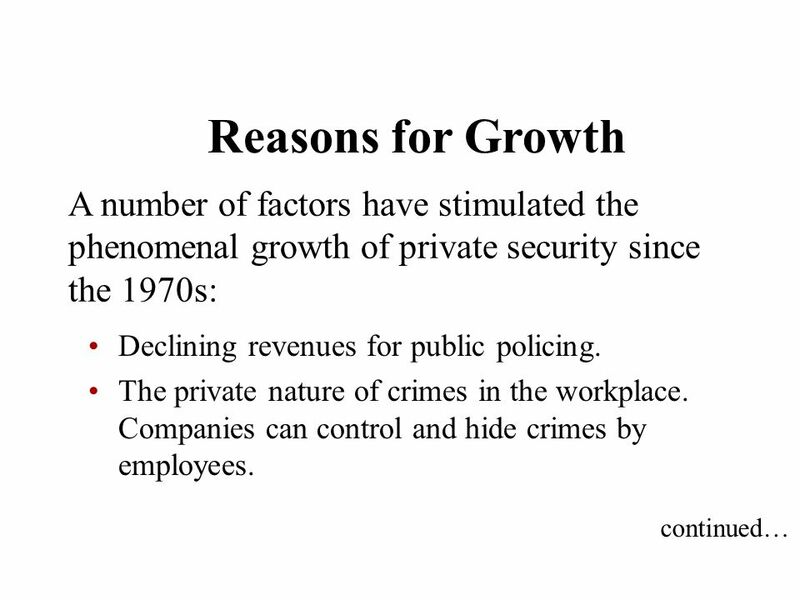 Fewer constitutional limitations on the actions of private security officers. 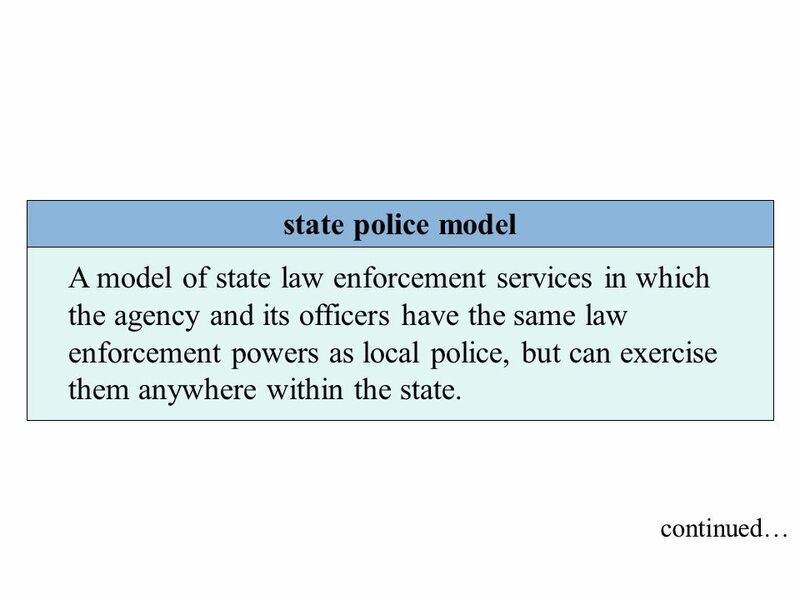 Download ppt "Chapter 5 – History and Structure of American Law Enforcement"
Federalism The National Government and the 50 States. © 2011 The McGraw-Hill Companies, Inc. All rights reserved. 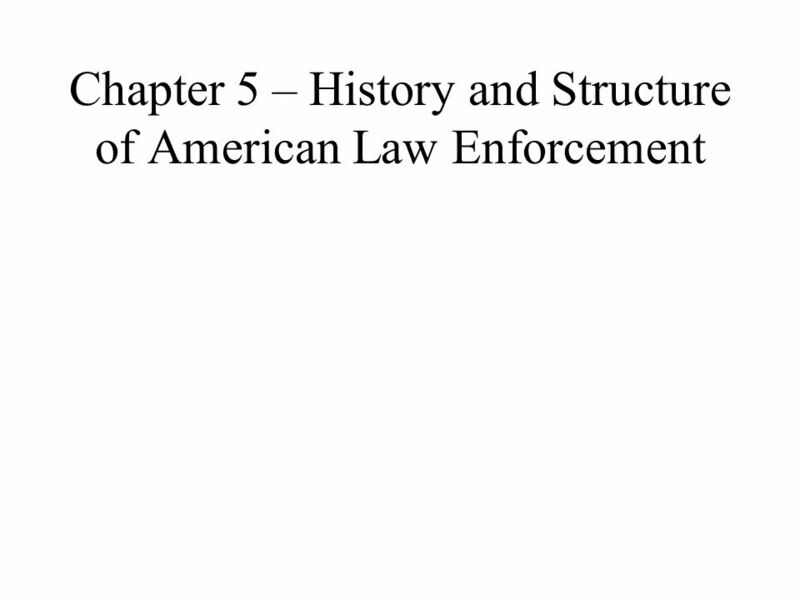 Police in America Chapter Two The History of American Police. 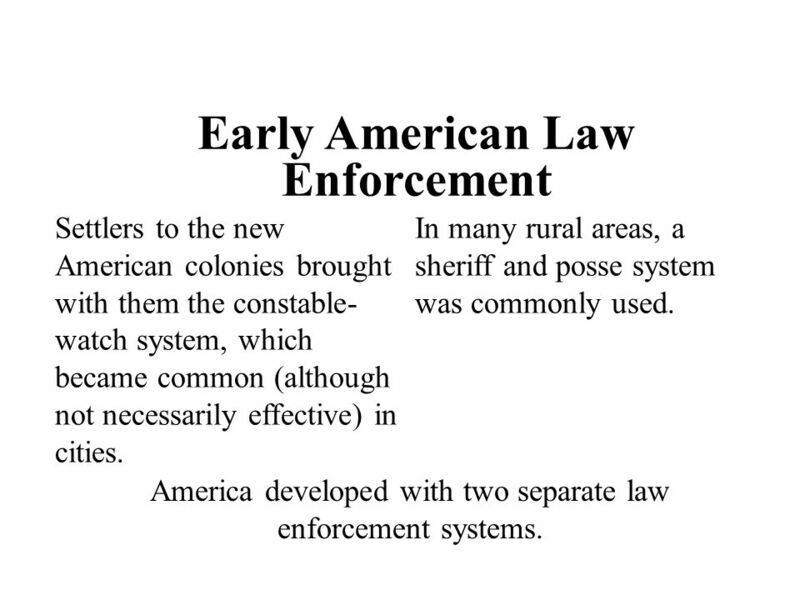 English Roots Much of early American policing was based on the British model. English law enforcement started around At that time: All able-bodied. Law Enforcement Today. A History of the American Police Colonial Times: Mirrors the English System Led by citizens – constables and nightwatchmen The. Copyright © Texas Education Agency All rights reserved. Images and other multimedia content used with permission. Copyright and Terms of Service. Police Powers in Great Britain. Table of contents Police aims Historical development of the police force Main police powers Exercises. AN OVERVIEW OF THE AMERICAN LEGAL SYSTEM.  Branches of Government  Legislative  Executive  Judicial  Levels of Government  Local  State  Federal. 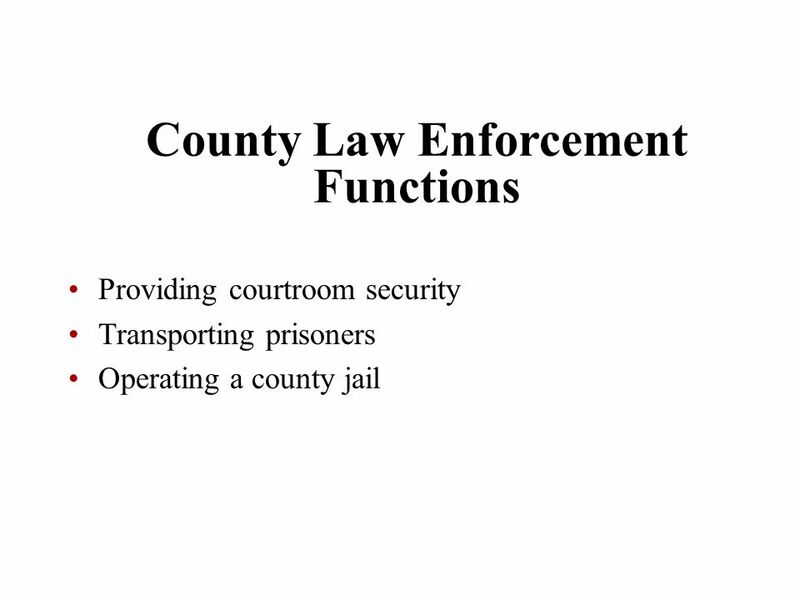 UNDERSTANDING THE BASICS OF LAW 1.03 FEDERAL AND STATE LAW ENFORCEMENT. 2013 Annual Report Sheriff Thomas E. Mills Civil Division Communications Division Corrections Division Law Enforcement Division SHERIFF’S OFFICE DIVISIONS. 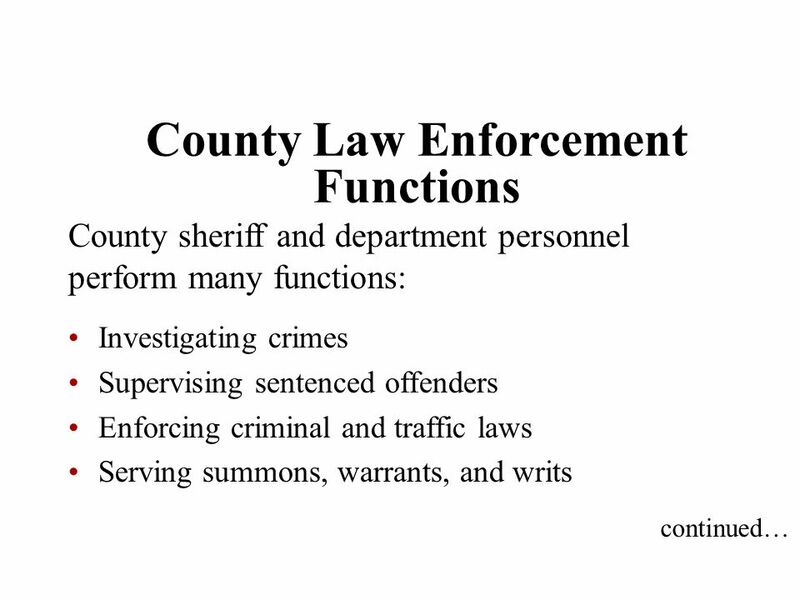 CRIMINAL JUSTICE A Brief Introduction, 5/E by Frank Schmalleger ©2004 Pearson Education, Inc. Pearson Prentice Hall Upper Saddle River, NJ Police.